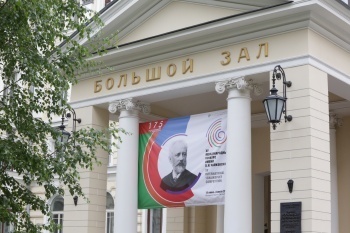 The semi-finals are taking place this week and next in the 2015 Tchaikovsky International Violin Competition, and if you'd like to catch up on them or watch some live performances, here is a link to both the live feed and the videos. Here is the schedule (in Moscow time). The competition has violin, cello, piano and vocal divisions; and prize winners will be announced July 1 for each, with gala concerts July 2 and 3. Top prize for each division is $30,000, with one grand prize of $100,000 going to the top winner among them all. Jury members for violin are: Salvatore Accardo, Yuri Bashmet, Maxim Vengerov, Liana Isakadze, Leonidas Kavakos, Ilya Kaler, Boris Kushnir, Mihaela Martin, Vadim Repin, Roman Simovic, Viktor Tretyakov, Maxim Fedotov, Vera Tsu Wei Ling, James Ehnes, Michael Haefliger and Nikolaj Znaider.